At the age of 67, retired after three decades working at Ralphs, Rose Capozzola spends nights sleeping on the sofa. The bedroom in her Simi Valley apartment belongs to her 14-year-old foster child, Dillon James Long. He is also her great-grandson. Nearly 65,000 seniors across California are raising their grandchildren, including about 1,200 in Ventura County. And 43 percent of them don’t have enough money to do it, often receiving just enough in Social Security and other income that they don’t qualify for food stamps and other assistance, according to a new study from the UCLA Center for Health Policy Research. “They are going from having their heads just above water to drowning,” said Steve Wallace, a study co-author and chair of UCLA’s Department of Community Health Sciences. Capozzola is still afloat, but it hasn’t been easy. A complicated sequence of family events meant Dillon was headed for foster care more than four years ago — two months after he was diagnosed with leukemia. His great-grandmother took him in because she could. He’s in remission, with his last chemotherapy session conducted the day after Christmas. His monthly blood tests and other medical costs are covered by Medi-Cal. Groups such as the American Cancer Society and a nonprofit called Kids & Families Together have helped. But when Capozzola applied for food stamps, she was told she made too much money. Social Security brings in $965 a month. The state pays her $890 a month for being a foster parent. Her pension adds $725 a month for a total of $2,580. She always makes ends meet. But sometimes when cash is low, she uses her charge card to buy groceries at Wal-Mart. An average of 6,327 grandparents in Ventura County were raising their grandchildren from 2009 to 2011, according to census data. And 1,203 of those people were seniors, defined as 65 or older. The trend is pushed by divorce, substance abuse, incarceration, mental-health issues, a death in the family and layoffs. The median annual Social Security income for seniors in the county was $12,504 for individuals in 2011 and $20,488 for couples. The UCLA study evaluated the cost of housing, food, health care and other needs in counties across the state. It said an elderly couple renting a one-bedroom apartment in Ventura County needed $32,109 a year to survive. Add a grandchild to the household and a two-bedroom apartment and the needed income jumped to $41,572. With three grandchildren, the needs added up to $59,815. “Suddenly, you have a really large deficit and very few ways to increase income,” said Wallace, adding that grandparents often put the needs of children first. What is likely to happen is they skimp on their own needs, she said. Jeanne Burton, of Ventura, feels lucky. Her home is paid for and her husband’s career as a tile contractor means they built a modest savings, although almost all their living expenses come out of Social Security income of about $2,000 a month. She’s 72. He’s 82. They’ve been raising their great-grandson, Aydin, since he was born three years ago and spent five weeks in a neonatal intensive-care unit. Because his parents were unable to care for him, he was likely headed for a foster home. “I said, ‘I am not too old to raise the child,’ ” Burton said. She shops at thrift stores and relies on a government nutritional program for help with groceries. Day-to-day costs are manageable. They worry about saving money for the future and college, topics that trigger conversations about using the house to borrow money. “I just want to make sure there’s money for Aydin, and it’s really difficult to save,” she said. Children raised by their grandparents qualify for Medi-Cal. 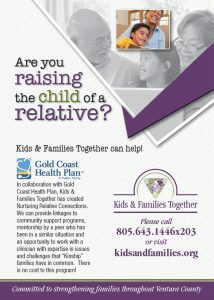 If the kids are placed with their grandparents in foster care, the caregivers may receive $600 a month or more. Groups like Kids & Families Together contract with county government to provide food pantry, transportation and other aid. But observers say the needs are many. Authors of the UCLA study contend seniors often don’t qualify for assistance programs because eligibility is measured by the federal poverty level. To qualify for food stamps, an individual has to make no more than $1,211 a month — 133 percent of the federal poverty standard. The UCLA study was conducted by university researchers in partnership with the Insight Center for Community Economic Development, a group that works to build economic health in vulnerable communities. They support a different calculation, called the elder index, designed to measure real costs facing seniors. Study authors used the elder index to contend that an elderly couple raising a grandchild in Ventura County could need $3,465 a month to make ends meet — more than double the federal poverty level. Capozzola wants all the help she can get. But not getting it won’t stop her. She’ll deal with the finances the same way she faces her grandson’s health concerns and the occasional disagreement. “We get through it,” she said.